Making the news last week was the amusing story of the zoo in Belgium that recently captured a video of a family of elephants appearing to sway in unison to a performance of live classical music. As the Guardian reported it, a group of violinists were asked to play in front of the animals’ enclosure in order to ensure they were not disturbed by the music ahead of an upcoming performance to be held at the zoo. The musicians were surprised to discover that the elephants actually appeared to enjoy it, seeming to listen carefully before beginning to sway their trunks and rock their bodies in time. This surprising quirk of elephantine behaviour has been noted before. 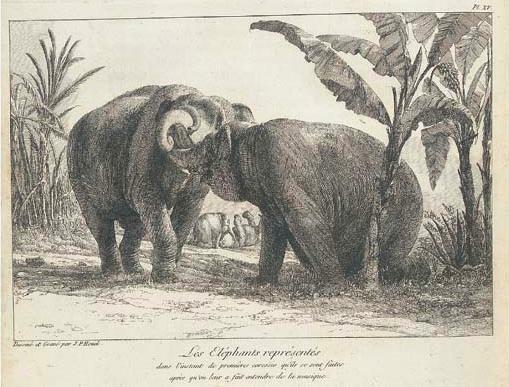 On 29th May, 1798, a group of eleven musicians from the newly established Conservatoire de Musique assembled at the Jardin Des Plantes in Paris to perform a concert especially for the enjoyment of their two new elephants, Hans and Maguerite, recently arrived from India. The programme, performed for the pair whilst they dined, included a dance in B minor from Gluck’s Iphigenia and an adagio from the opera Dardanus, among other pieces. The report on the concert in the Musical World recorded the elephants’ reactions to the different performances, noting their gait which “followed the undulations of the melody and the measure”. It was a solo bassoon rendition of ‘O! ma tendre musette’ in C minor that touched them most deeply. They came closer to the orchestra, “swaying their trunks gently, and seemed to breathe emanations of love”. Houël, Jean Pierre Louis Laurent. ‘‘Les eléphants représentes dans l’instant de premières caresses qu’ils se sont faites après qu’on leur a fait entendre de la musique’ , in Histoire Naturelle des deux Elephants, male et femelle, du Muséum de Paris. Paris: Houël, Pougens et. al, 1803. The elephant concert was one of many experiments of its kind that took place with increasing frequency as the nineteenth century progressed. With the emergent doctrine of evolution gaining currency, the boundaries between animals and humans became progressively blurred, inspiring scientists to search the animal kingdom for evidence of the sorts of mental and emotional qualities previously supposed to be exclusive to humanity. The artistic impulse and the ability to appreciate music were now being discovered in dogs, cats, horses, birds, insects, reptiles, and fish. The theory that music can affect the emotional states of animals is not neither new nor discredited. In antiquity, one thinks of Orpheus charming the wild beasts of the forest with his lyre, or the Breton bard, St Hervé, whose music supposedly tamed a wolf with his song. Nineteenth-century natural scientists, however, tended to insist that actual critical appraisal was taking place in the reactions of their animal audiences. There are several reports, for instance, of the acumen of the dog of a particular pianist who would listen attentively to op. 19 of Dussek until the 48th bar, at which point it would yelp piteously and seek refuge from the sound. The German musician, Joseph Mainzer, wrote that experiments on a number of dogs revealed that A major always makes this creature uneasy, while E major causes such excitement that once when the experiment went on too long, the dog in question became furious and died in the most frightful convulsions. It is, of course, difficult to know whether a dog really objects to the key of E major, or to Dussek’s being slightly derivative of Beethoven, as it is difficult to say whether the elephants in the video are truly enjoying the music. The original experiment, however, recorded compelling evidence that Hans and Marguerite did. The elephants, supposedly so overcome and aroused by what they had heard, were later beheld consummating their “jouissances amoreuses” by an attendant natural scientist. We are still awaiting news from Belgium as to whether any similar reaction was noted in their elephants following the performance. It could be useful information for zoos finding it difficult to breed animals in captivity. Bolero?